It can be more important WHEN you buy or sell, than WHAT you buy or sell. Regardless of investment quality, I didn’t like holding stocks during a bear market because everything went down at some point during the bear cycle. Buy and hold investors don’t have this problem, they give back a substantial part of their bull market winnings to the Bear. I was too greedy to knowingly let this happen. So I looked for the unobtainable secret to the stock market. Unfortunately the ability to predict a bear or bull market would see a lot of years pass before I knew a major market turning point was coming. That means lotsa dollars said goodby on their way into other hands from my vulnerable savings. The beginning of my stock market learning process started in 1955 as I questioned my grandfather about his investments in utility stocks for their dividends. He gave me my start on understanding how the investment process worked. I saw him lose money chasing dividends and I found that bothersome. Often times a high dividend company would not be able to support its high dividend payout and would cut their dividend, which in turn would cause the stock to tumble. As I saw this take place occasionally to my grandfather, I vowed to never chase a dividend that didn’t have the fundamentals to support the dividend. In 1955 computers were machines that filled a refrigerated room and only the government could afford to buy one. It would be another 22 years before I had my first computer (1977) and could chart and study stocks by machine. One important point regarding charting stocks by computer, it will cause you to lose an edge that can only be found charting by hand. Try charting by hand for at least 6 months and see if you can tell the difference. You’ll find that you’ll get in sync with the stock as you chart by hand. I found myself getting in the groove with the stock or overall market as I charted by hand. Many times I felt I’ve left some good practices behind me. I’ve looked back at some of my writing from the 1970s and 1980s and wondered, “That’s really good. How did I do that”??? In 1955 I was too young to have my own brokerage account and I had very little money. I was a typical broke 14 year old kid, but I had some crazy ideas about the stock market. I convinced my father to open a brokerage account and I pooled my money with him. After I did the research on a group of stocks, my father would agree with my suggestion to buy a particular stock. The stocks we bought were usually high flyers with lotsa followers, think of the FAANG stocks of today. But the high flyers drove my father batty because of their high volatility. He liked it when the stock went up, but caused him too much anxiety when the stock corrected. From prior observations, I knew that stocks that went up 7-10 points in one day were going to lose a big chunk of that back sooner or later. I understood all about zig zag as a normal stock market process (observation taught me normal movement). One stock we owned was Lukens Steel (imagine a steel stock as a high flyer, different times folks). It had a strong uninterrupted run over many days of sizable upside points, and then it lost a big part of that gain all in one day (17 points). My father thought the world had ended and he sold. Lukens Steel subsequently soared far above his sell point and was a source of irritation for me. We left a LOT of money on the table. In these early days I would take a trip to our nearest office for Merrill Lynch Pierce Fenner and Beane. Yup, there was a Beane at the end of their name when I started my stock market education, but it changed in the 1950s from Beane to Smith. I went to their office a few times and they had a wall of electro mechanical price dials that were spinning by solenoid activation. At the top of the high, low, last price dials would be the symbol for the stock represented. These devices were really noisy and were constantly clattering as prices changed. Down the block was EF Hutton, considered to be a more upscale operation (la ti dah). In those days one million shares in a day was a big deal and the stock market was also open on Saturday during the 1950s. Things have changed a bit since then. Ya think??? After Lukens Steel I was convinced that I had to control my own brokerage account. I saved all my money from my first real job (Jack in the Box), plus my savings and my father opened another brokerage account (still in his name because I wasn’t legal age), but I had complete authority over this account (my money, my account). The account had only my money and it was mine to make or break. This was the independent beginnings of my investing career. In the fall of 1957, the first stock I bought for “my” account was Ampex (they invented the video tape recorder). I bought it after it had gone up a bunch, split and I paid $44/share. It promptly went down to $40 and sat there for several months. What a dud. It just sat there stagnant plus I had a small loss. Did I do something wrong??? Then one day for no particular reason it jumped several points, did nothing for a couple of days and then jumped again. This trend kept up for months. Naturally there were the normal zig zags, but before long Ampex was going parabolic. I sold it in the first half of 1958 at $120 and bought my first car. Hot stuff, I’m 16 years old and I bought a 1 year old car and paid cash. Ampex kept soaring and splitting, but I was happy with my car. I was greedy but practical. WOW! Making money in the stock market. This is so easy. Why should I ever work again??? I can buy and sell stocks the rest of my life and before long I’ll have more money than I know what to do with. Why aren’t more people doing this? I guess they just didn’t have my “talent”. “NEVER CONFUSE GENIUS WITH A BULL MARKET”. It’s very easy to confuse genius with a bull market. I personally knew a lot of geniuses during the late 1990s. They all thought I was nuts warning them about an ending to the 1990s bull market. They knew far more than I did, because they were stock market geniuses and I wasn’t. Yup, it’s real easy to fall into that trap. Been there, done that. By the 1990s I had been around the block many times and knew that stocks don’t reach for the sky forever. Knowledge is a scary thing as it makes you keep your feet on the ground, while those around you (new gunslingers) were making too much money without any fear. Meanwhile during my teen years, I did learn that there was a downside to stock market investing. I wasn’t a stock market genius anymore, I had just been lucky and now reality was hitting home. The bull market had hit the pause button and I wasn’t told about it. In later years as I gained more knowledge about the stock market, I developed a few rules. I was still a trend follower (aka crowd), but I had some discipline. My stock selection was pretty simple, I would buy a stock with high growth prospects (usually a company with little competition and a great product. After the 1973-1974 bear market I bought Pall Corp (filters) and Radio Shack – Tandy (you know them). I also looked for sponsorship (persistent buying volume) as this was an important component of my stock selection. I would hold the stock as long as the growth prospects remained intact and the company’s price and volume showed continuing spsorship. I favored a stock that could stop its correction by only penetrating a small distance into its prior peak. I watched my stocks (lotsa eggs in only a couple of baskets) very closely and usually knew when it was acting right or wrong. I always charted the stock’s daily price and volume by hand. From 1957 to the early 1970s, I used stock selection as my stock market investing technique. During this period Standard & Poors had a “monthly stock guide” (blue pages and cover). I used this booklet to scan for stocks with good fundamentals and were on the move to the upside. This was simply finding a stock with good fundamental prospects PLUS it had to have sponsorship, meaning there were people or institutions that were buying the stock. I abhorred the prospect of buying a great fundamentally sound stock to see it sit and do nothing. That’s not the name of the game. Waiting was wasting my time and money. If you are unfamiliar with the term, margin pyramiding, hopefully the following example can clear the fog. A margin pyramiding strategy is an investment approach with higher risk, but with proper money management it can produce great results. For example: During 2008, the market collapsed with only a few small upward corrections. If a trader was short in this type of market environment, it would be a prime candidate for margin pyramiding. In the below chart, Citigroup took a beating during 2008. In a pyramiding strategy the trader would add to their short positions on each upward bounce using the paper profits in their margin account. Paper profits exists as real money in your margin account (ask your broker). This process of adding to your short position with your paper profits would have continued down to the bottom in March 2009. The end result is this would have produced much greater returns than simply shorting the stock at the peak and riding it down in a single trade. Simpler that way but doesn’t maximize your position. The only problem using this technique is that it raises the level where you can receive a margin call. But I’ve used this technique for years without a margin call. Picking the right stock and the right timing is extremely important, otherwise you could easily be in trouble. Margin pyramiding was my first introduction to higher leverage than conventional margin. I don’t remember the year that I first used this technique. When I began investing in the market, margin was 70% and it has fluctuated considerably through the years. It’s been unchanged at 50% since 1974. Looking at the margin rates and dates below, the present 50% rate has been unchanged for over 40 years. Prior to 1974, margin rates had been changed every couple of years. The FED used margin rates to slow or accelerate the stock market. They’ve steered clear of this method for a long time now. Before the early 1970s, there were no exotic stock market products, such as index mutual funds, index ETFs or stock market index futures and their options. There were individual stocks and that was it. During the mid-1970s to late 1970s, I was a subscriber to Edson Gould’s “Findings & Forecasts”. Many thanks to Edson Gould for teaching me perspective and the importance of studying the psychology of people and the “crowd”. Before Edson Gould’s teaching, it was a long and sometimes tortuous learning process for me. When the learning process was painful, I always asked myself, what did I do wrong, what can I do to correct this mistake and not repeat it. Reflection taught me humility (which I lost for awhile during the 1980s, more later) and created rules to be followed. During the early 1970s, I read an article (Time magazine??) about the Coral Index based in London. 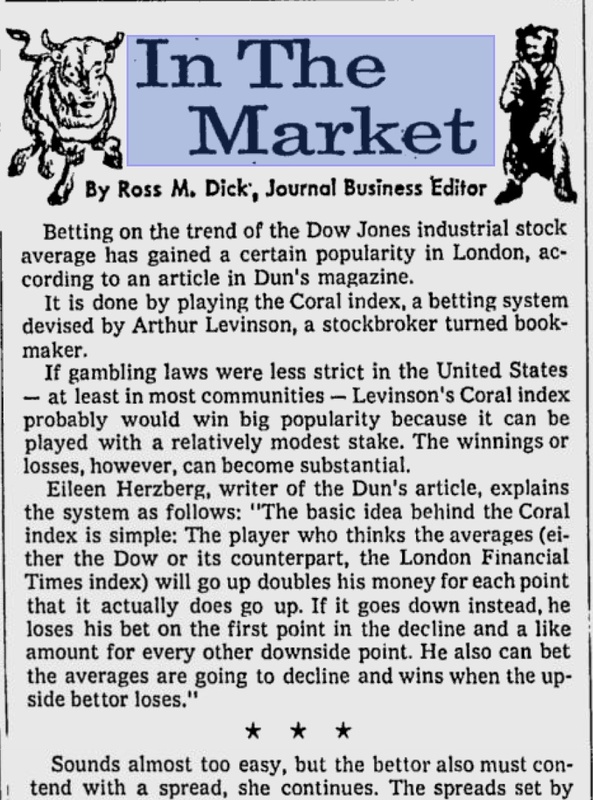 Coral was a gambling establishment that was taking bets on the direction of the Dow Jones Industrials. Hmmmm, this seemed like something I might want to try. The following is not the initial article I read, but it gives you a general sense of the Coral Index. There are a few errors in this article. The next article explains that the maximum bet was 1,000 pounds and makes a few items clearer. LONDON BOOKIES TAKE ON STOCK MARKET, The New York Times News Service, LONDON — It is one of the most frustrating things in the stock market, you “know” it’s going up, but you don’t buy because it would be just your luck to pick the one stock in 20 that would head straight down. You will have called the market right again — and still not be making money Well, there’s help for you. A small, little-known company takes bets on which way the Dow Jones industrial average will move. No more risks of buying Penn Central or Equity Funding. No more commissions or advisory fees to pay. No more tying up all your capital. All you have to do is pick up the phone, dial 011-44-1493-5261, and ask for Christopher Hales, the stock market’s Jimmy the Greek. Hales and his two associates here are market bookies, employing the point spread and their wits against the punters of the world. “It’s a gamble — you can’t get away from that”, said Hales, a 38-year-old former stock market and commodities operator, who looks as if he would be as much at home in the lofty reaches of the Bank of England. Here is how it works. You buy or sell “lumps” of the Dow Industrials, composed of 30 leading issues on the New York stock Exchange. The minimum is two one-pound units ($3.90) and the maximum is 1,000 units ($1,950). If you buy and the market goes up, you will probably make money. You will also win if you sell and the market falls. Like all businesses, Hales’s company, Coral Index Ltd, needs a profit margin. It creates this by making a 10-point spread between its buying and selling prices, usually straddling the current level. Last Friday, Jan 27, for example, the Dow closed at 764 12. Coral opened its quotes Jan 30 at 760 for sellers, 770 for buyers. If you bought, say, 10 units at 770 and the index jumps to 810 you would make 40 x 10 pounds, or 80 pounds. You don’t have long, however, to be right. No bets last more than 30 days “We reckon the Dow won’t often move more than 50 points in a month.” says Hales, noting that the relatively short period tends to keep its own and customers’ losses from getting out of hand. It also allows Coral to keep slicing away with the spread though Hales insists this is not the biggest factor in its profits. “What we’re really relying on is that the average investor is going to be more wrong than right.” The spread helps us to balance the book and gives us enough to cover the overhead. All transactions are made by phone; the mail is considered too slow, too unreliable and in some places of dubious legality. About half of Coral’s business is in the Dow Industrials, with the rest in the Financial Times of London’s industrial ordinary index of 30 British stocks. The spread for the London market is five points because of its lower level. Coral, operating from a second-story office on fashionable Berkeley Square, began taking bets on the Financial Times index in 1964, adding the Dow in 1967. It didn’t attract much interest, however, until the 1970s. and even now only about 100 customers of the 6,000 are Americans, many living overseas. Most customers are brokers or others with close ties to the market, some hedging positions in options or stocks. Swiss money managers are frequent players. Coral says: There are also nonprofessional bettors in the United States, Europe, and Australia. If you are a really high roller, say $40 a point and up. you can telephone Coral collect. You can also haggle about the price. Although the company does not guarantee to take more than 100 units, you can probably negotiate higher stakes, perhaps at a higher spread. Hales says there are a few people who win consistently. They are not particularly unwelcome, he says, since they help Coral adjust the spread, which in a volatile market may change 20 or 30 times a day. One reason Coral thinks most bettors will be wrong is that they are usually playing with their own money and thus tend to make mistakes under stress; the “house.” using corporate funds, can remain calm. In the early days. Coral would often partly hedge its position by buying or selling some shares. But it couldn’t improve its performance this way and now unlike most bookies it does not lay off any of its risks. “We don’t hedge anything, ever,” Hales says. 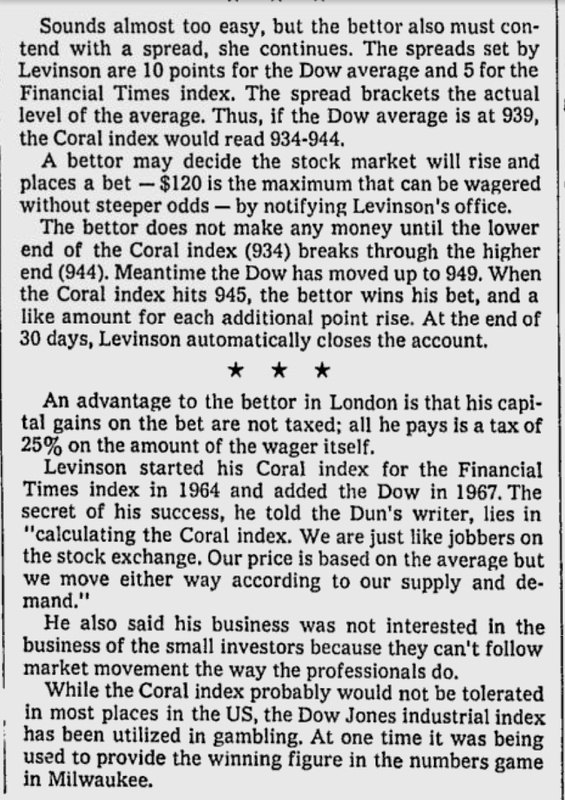 Sometime in the late 1970s (I forget the exact year), I opened an account with Coral Index and began betting on the direction of the Dow Jones Industrials. I would call London several hours before the New York Stock exchange opened (calling usually around 3 AM Pacific times) and place my bet. I spent a lot of time with no bet, waiting for the market to be on the edge of a turn, up or down. I never made a bet unless I thought a market turn was imminent and probably significant. I spent a great deal of the time without a bet, but that was fine because winning a bet had a high rate of return. It was kinda funny when I called to place my bet because there would always be a flood of bets going in the opposite direction of my bet. This helped me considerably because I would be given a very favorable spread in the event of a market turn. This was due to the heavy betting pressure by the crowd in the opposite direction of my bet. The spread always follows the crowd and keeps it harder for them to win. During a quickly declining market, Coral would create a spread that was heavily biased to the downside. This is how the house tried to put the odds in their favor. Without a favorable spread for the house, Coral could be out of business. Due to the high negative spread, the market had to fall a fair distance before your short side bet would be profitable. But if you placed a long side bet during a high negative spread situation and a turn took place soon, your profits were instantaneous and greater than normal. Big rush when that happened and that was frequently the situation I faced, crowd going in one direction and I’m going the other way. For instance: If the Dow Industrials closed yesterday at 850 and had been falling steadily with increasingly heavier downward pressure, you would receive a price around 830 for a short and 840 for a long. Playing for the turn, I would buy a long at 840. If the market rallied 20 points over the next week to 870, my profit wasn’t 20 points. It would be 30 points (870 – 840 = 30). This was because I received a 10 point discount from the prior close when I placed my long side bet. That gives you an idea of how the spread pressure could work in my favor. I remember one occasion in particular when I had bet long and received a very high 20 point discount from the prior day’s close. This was due to the huge downside selling pressure. Remember during this period of time, the Dow Industrials price level was always less than 1,000, averaging around 800-850. 20 points at that time represented approximately 600 points in today’s market. In many ways, the Coral bets had the same significant problem of an option, TIME. Time was constantly your enemy because the bet only lasted 30 days. You only had 30 days to overcome the spread. For this reason I would only bet when there was a significant chance of a turn. Because of the time factor, my money usually was sitting in a bank in London. I never had a loss during my time with Coral and this had been noted by the people that I dealt with at Coral. I was always taking an opposite position against the present market trend and this made me an unusual client at Coral. Along the way, I had some interesting conversations with Coral. But things changed when another opportunity arose. In 1981 the Kansas City Board of Trade introduced trading in a stock index futures contract based on the Value Line Index. The leverage was quite high and the initial margin was low. This was the first stock market commodity index future. The following article is from the New York Times, March 26, 1982. The new stock-index futures based on the Value Line average followed the overall price trend in the stock market yesterday by advancing 60 to 65 points, or $300 to $325 on a contract, with the active near-June delivery closing at 124.65, for a gain of 60 points on the day. (Bob’s note: a point is a penny and the leverage is $5 per penny). Indeed, since the first stock-index futures began trading on the Kansas City Board of Trade last Feb. 24, contract prices have mirrored not only the Value Line average of 1,683 stocks, but also the ups and downs of the market. According to Mr. Brown, the generally accepted rule of thumb that is being used is a ratio of about 7 to 1; that is, each 100 points, or $1, move on the Value Line is equivalent to a $7 move on the Dow. Yesterday, the Dow Jones industrial average of 30 shares closed up $4.29, which is seven times greater than the 60-point gain on the active June Value Line futures. One major difference between the two averages is that the Value Line average figures are calculated by a mathematical formula, while the Dow Jones average represents the dollar value of the 30 shares, adjusted for stock splits and related changes in prices. Further, the futures price of the index is not necessarily the same as the Value Line average, compiled by Arnold Bernhard & Company. For example, an officer of the company noted that the average closed at 125.91, up 55 cents on the day, compared with the spot March futures, which ended at 125.65. The prices of the Value Line futures are determined in the trading pit of the Kansas City exchange. But the Dow-Value Line ratio is deemed important because most traders have been accustomed to relying on the Dow Jones average as a convenient barometer of market sentiment, and some thought that investors would find it difficult to adjust their thinking to the much broader average. But the open interest, or the number of contracts that are open for trading, has grown steadily. As of Wednesday’s close, the open interest had grown to 3,302 contracts. Yesterday’s figures will be released this morning, as is the practice on all commodity exchanges. Recent volume has averaged 1,900 contracts a session. This activity compares favorably with financial futures in their first month of trading. Specifically, each index contract consists of the 1,683 stocks in the Value Line index multiplied by 500. Thus, the June futures contract, which closed yesterday at 124.65, works out to a value of $62,355 in stock. Each one point move in the Value Line index was a move of $500 in my equity. Initial cash margins for speculators, or non-trade hedgers, had been set at $6,500 (about 10% margin). I traded the Kansas City contracts for a little more than one year. But the handwriting was on the wall. The CME had introduced a futures contract based on the S&P 500 index. The CME had a broader appeal and their contracts surged in popularity displaying excellent liquidity. The CME was the big leagues compared to Kansas City. The first SP 500 contracts were equal to 10 mini contracts (a mini contract is today’s norm) and the leverage was $500 per SP 500 point. I made the shift to the SP 500 contract as it became obvious that liquidity was much greater at the CME. With higher liquidity, market orders were executed very quickly with smaller deviations from the quoted price. To this day I’m still trading the SP 500 futures contracts, but my use of leverage is lower after peaking at an absurd level in 1987. I guess I’ve grown conservative in my old age and the gunslinger has also gotten smarter along the way. Just remember that with high leverage, you make a lot of money when correct and you lose a lot of money when you’re wrong. Everyone should always use stops to control their losses while trading the SP 500 futures contracts. Some traders use mental stops, but the problem with mental stops is that the trader is likely to rationalize that the position is correct and it’s going to turn around very shortly. The situation usually only gets worse. I’ve never used mental stops, preferring the hard stop instead. Stops should be placed carefully. You need to figure out what shouldn’t happen if your position is correct. At what specific point has your position gone wrong??? Place your stop at that point. This requires some thought to arrive at the right stop level. The stop should be entered immediately after your position is established. I don’t believe in setting stops at a certain percentage above or below your position. That’s an arbitrary level and means you aren’t doing your homework. I believe that stops should be based on the penetration of a significant high or low that wouldn’t take place if your position is correct. Your position ideally should be established reasonably close to your stop so your loss is easily tolerable if you’re wrong. If you don’t use stops, you could freeze up and never liquidate your position until you have the forced margin call. Even worse is the unattended position. Somebody gets busy and forgets to watch their investment. When they remember to look they may be pleasantly surprised at how much money they’ve made, but what if they find they’ve lost a huge chunk of their account. It happens. I urge those who are new to commodity contract trading to limit their trading to one contract for a considerable length of time. It’s your learning experience at futures school and your learning isn’t complete until you’ve encountered all types of markets and market surprises, specifically a bear market. Surviving and making money is always the name of the game. My investing experiences began with speculative investing. Evolved into position trading in the Dow Jones Industrials, the Value Line Index and then the SP 500 index (individual stocks, Coral Index, Kansas City Value Line and now the CME SP 500). So now we’re in the early 1980s and I’ve been tutored by the best technician of the 20th century (Edson Gould) and I’m no longer investing in individual stocks but commodity contracts that represent the entire market. In August of 1982 I anticipated a sharp turn upward in the stock market after falling since its peak in 1981. At this time Wall Street is deep in depression and can’t see any reason why the market should rally. Wall St doesn’t realize that FED Chairman Volcker has almost single handedly broken the back of inflation (causing 10% unemployment). Soon a wild rally in bonds will begin as interest rates plummet for the next 35 years. Reagan is President and the nation will soon believe in itself again. I bought a few Kansas city contracts on Wednesday August 4, 1982 as I had detected a bottom in the market. But the market continued on down on Thursday and Friday. My wife and I went out to dinner that Friday night and I explained to her that I’m getting killed by the leverage as the market hasn’t turned up as anticipated. We decide to see what happens on Monday as I reassured her that my super secret indicator has turned up. On Monday August 9, 1982 the fuse was lit for the stock market rocket and off it went, wiping out my losses and putting me solidly into a profitable position. That August of 1982 was the birth of the 18 year bull market that didn’t end until 2000. I’m was on a roll and making a lot of money. Beginning in 1982 I began increasing my use of leverage and bought more and more futures contracts. My leverage was enormous by 1987 (absurdly enormous). As we approached 1987 I had suffered no losses in a couple of years and had nothing but hugely profitable trades. And then . . . September 1987 hit and something started going wrong with my super secret indicator. Actually I was not interpreting it correctly as the indicator had transitioned (my arrogance blinded me). By October 4, 1987 I threw in the towel and bailed on the contracts as I had lost almost all of my 1980s gains due to very high leverage in the wrong direction. I was out and sitting on the sidelines when the October 19, 1987 crash occurred (Black Monday, Dow Jones Industrials lost almost 23% in one day). If I had been on the wrong side of that day, I would have been bankrupt, losing everything, house, businesses, etc. But I sat quietly on the sidelines watching despair and grief overtake Wall Street. Many dealers, traders and brokerages were wiped out on that day. FNN in later years was swallowed up by the start of CNBC. Bill Griffeth and Sue Herera are anchors from FNN and now years late still on CNBC. What did I learn from this horrible incident? (1) My gunslingers days were finished, I now became a more moderate low leveraged investor, and (2) ARROGANCE KILLS . . . and my arrogance had almost made me into a pauper. My arrogance was derived from the fact that I’d forgotten what it was like to take a loss. Constant winning is not the norm and someday the market will catch you sleeping. Thus began an abrupt change in my speculative life. After 1987 when I felt like coming back into the market (it took awhile) I reduced my contract leverage to only one contract as I tried to rebuild my savings (still haven’t hit the 1987 high point and never will). To this day I only trade a few contracts because I have such a bitter taste of nearly going bankrupt. Immediately after 1987, I felt like Steve McQueen in the Cincinnati Kid, where he didn’t think he would ever win again. But I let the demons of the past die and moved on to a more normal speculative attitude. No more running around with my hair on fire, just took it easier and was thankful another day was still left for me. My knowledge didn’t die in 1987, I just changed attitudes to a more reasonable approach to the market. I’ve continued to expand on my knowledge of the market but as I said before stopping hand charting leaves something behind that will be missed. You linger longer when you are hand charting and become more thoughtful and less likely to miss something. In the old days I was out in front of the market where today, I am more likely to let the market tell me what is happening after a turn is made. In finality, never again would I abuse leverage and the following would become my mantra. I know old traders, and I know bold traders, . . . but I know no old and bold traders! The end of the beginning and the start of rest of my speculative life.